The most impressive rise in England with a fall of 18 m (60 ft). 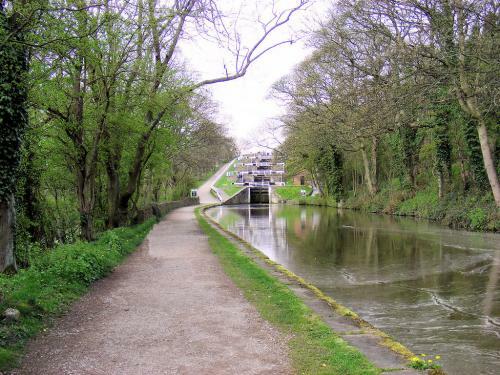 The Leeds & Liverpool Canal was the first of the Trans-Pennine canals to be started - and the last to be completed. The length and complexity of the route meant that the canal took an astonishing 46 years to build at a final cost that was five times the original budget. The canal originates from a proposal in 1765 to construct a canal from Preston to Leeds to carry woollen goods from Leeds and Bradford and limestone from Skipton. Prospective backers in Lancashire argued for the canal to start from Liverpool.The line of the canal, over 108 miles long, was laid out along the Aire valley by James Brindley, one of the greatest of the canal builders. He was offered the post of engineer but he declined because he had so much other work. Robert Whitworth and his brother started the construction of the canal but they didn't live to see its completion in 1816. River navigation couldn't solve all the transport problems of industrial Yorkshire, so artificial waterways, or canals, were cut into the landscape. 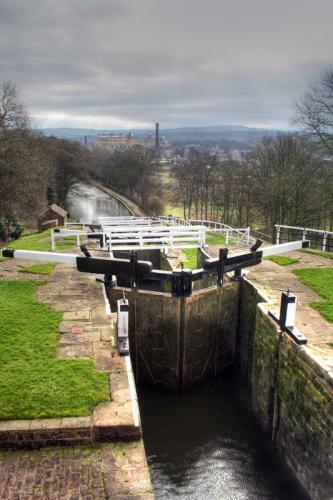 With the Pennines being so hilly, locks had to be introduced to raise or lower the level of the canal. 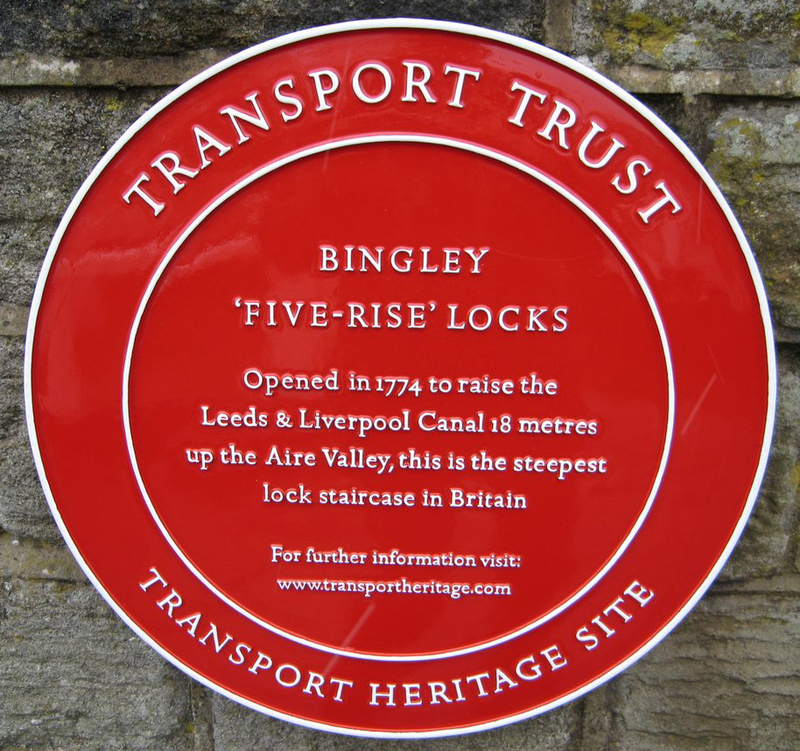 Bingley Five Rise lock, which alters the height of the water by almost 60 ft, is the most impressive in Britain. 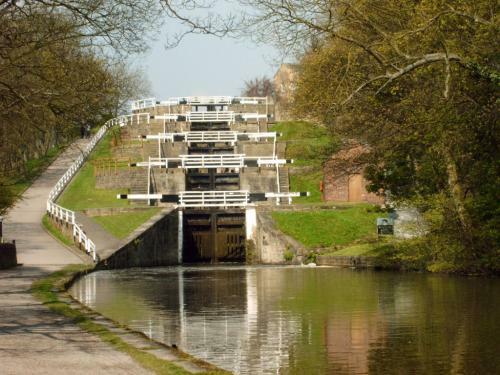 An amazing engineering feat, this stretch of the canal was opened on 21st March 1774, and the first boat down the Five Rise Locks took 28 minutes.The lock system was designed by John Longbotham of Halifax and built in 1774 by local Stonemasons. 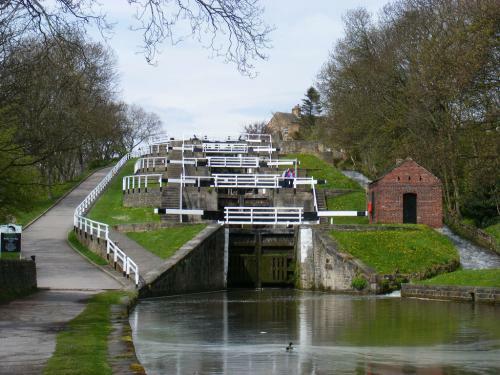 An 18th century engineering masterpiece, these five locks operate as a 'staircase' flight in which the lower gate of one lock forms the upper gate of the next. When completed, thousands gathered to watch the first boats make the 18 m (60 ft) descent. The staircase locks are slow to operate since all five must be 'set' before beginning passage. For a journey upwards, the bottom lock must be empty, with all the others full: the reverse is the case for a boat descending. It can take up to ninety minutes for a boat to work through the flight. 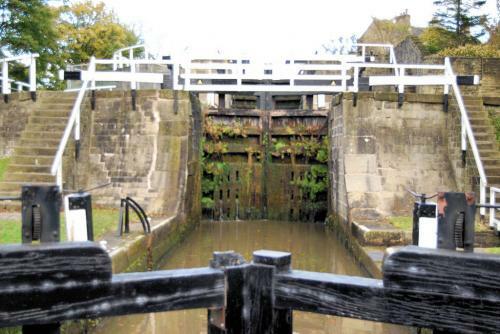 The five-rise is the steepest flight of locks in the UK, with a gradient of about 1:5. The intermediate and bottom gates are the tallest in the country. 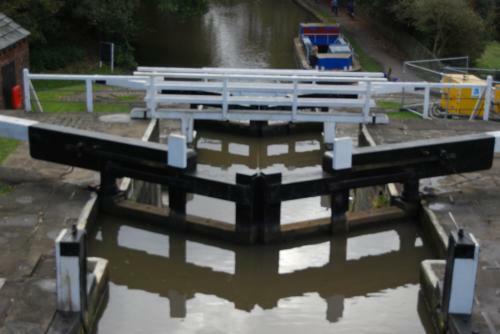 Because of the complications of working a staircase lock, a full-time lock keeper is employed. Only a few hundred yards downstream is another staircase - this time a three-rise flight, with a fall of 9 m (30 ft). The staircase underwent extensive restorative maintenance in 2004,and again in 2006 when the lock gates and paddles were replaced. A great deal of ongoing maintenance is required and the staircase is frequently part British Waterway's winter stoppage schedule.